The love between mankind and pet is an unparalleled bond. We are companion beings and there are few creatures in existence that are as special as cats when it comes to being our furry friends. The purring, fuzzy, snuggly, and most certainly eccentric creatures bring delight and wonder to our lives. 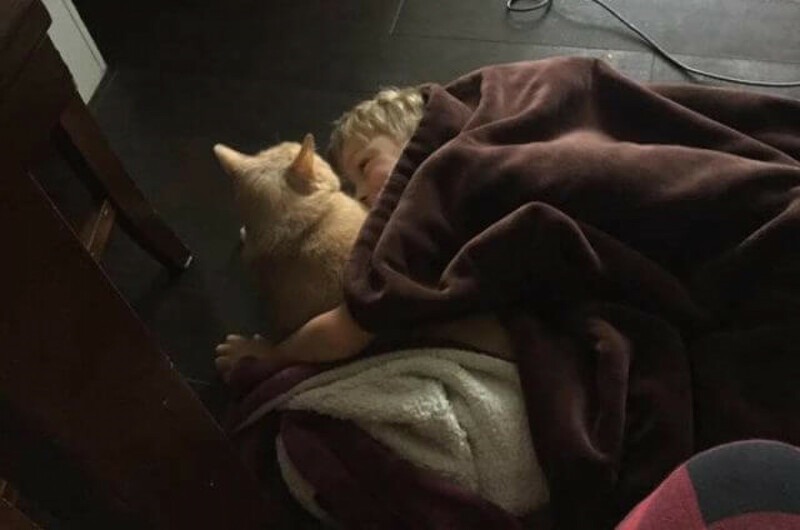 Of course for all the love adults have for their fur babies the truly unique bonds form between children and their pets. Kids freaking love animals, especially small ones. Especially babies. In fact, if you were to give an opportunity to a child to choose their own pet there's a high probability they will choose a kitten or puppy. Then comes along Easton. Easton isn't like other children, he sees beyond the cute. Easton sees the purr-sonality a cat or kitten has to offer and lets his heart guide the way. So it was only natural for his mother to let Easton pick out their next pet. But long before Elizabeth, Easton's Mother, took him to Exploits Valley SPCA to pick a pet she brought home a cat that she picked out. In 2014, Elizabeth came home from a local shelter with three-year-old Oscar, who was an "extra fluffy" 20 pounds. Of course Elizabeth understood that however adorable her fat cat was, it wasn't the healthiest choice so her and her family helped Oscar shed 5 pounds. In case you're wondering, that's a big deal for a cat. If we were talking about a human losing weight that would be the equivalent of 50 pounds! 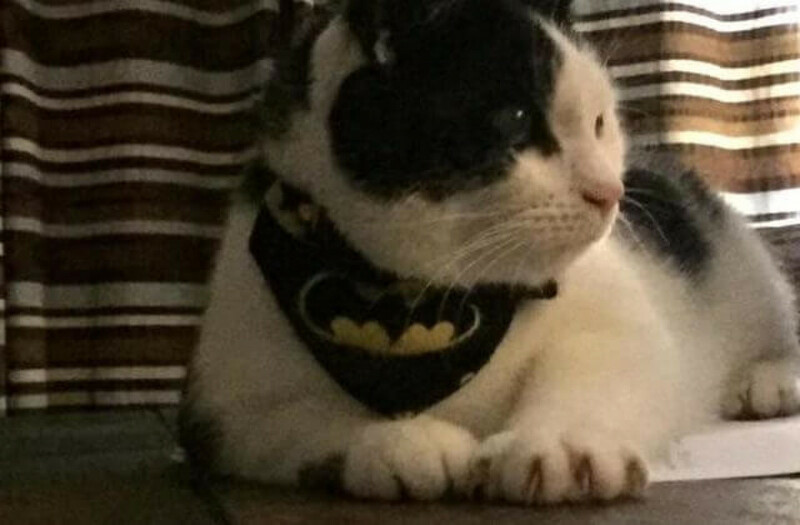 A lot of the hard work in helping Oscar become an active (and thus increasingly healthier) cat was the result of Easton's love, devotion, and efforts. A few years have passed since Elizabeth and Easton took in Oscar and transformed his life and Elizabeth began to realize that her family was not quite complete. She decided it was time to adopt another cat and she knew the best person to help her was Easton. Easton proclaimed with surety he wanted a "fat cat like Oscar." Together, the pair logged onto the Exploits Valley SPCA adoption page and began to comb through the pets available for adoption. They spent a great deal of time gazing at and reading about dozens of animals including adult dogs, sweet little puppies, fluffy cats, and even precious kittens! Yet no amount of adorable baby animals could persuade Easton away from what he knew in his heart he wanted, one more “extra fluffy cat." Easton found his choice in Tiny. Lots of shelter cats have a story and Tiny was no exception. Tiny had been turned over to the shelter alongside his sister Trinity. They were left at the shelter due to their owners dealing with "unforeseen circumstances." Often when siblings are turned in together they are closely bonded and should not be separated even for adoption, but Tiny and Trinity were not as closely bonded as siblings usually are and since older, obese cats are significantly harder to adopt out the shelter was more than willing to separate them into different homes. Tiny's ride to his forever home was a ride of freedom and promise and the bond between Tiny and Easton was nearly instant. The nervous cat cautiously climbed out of his crate then snuggled up into Easton's lap. 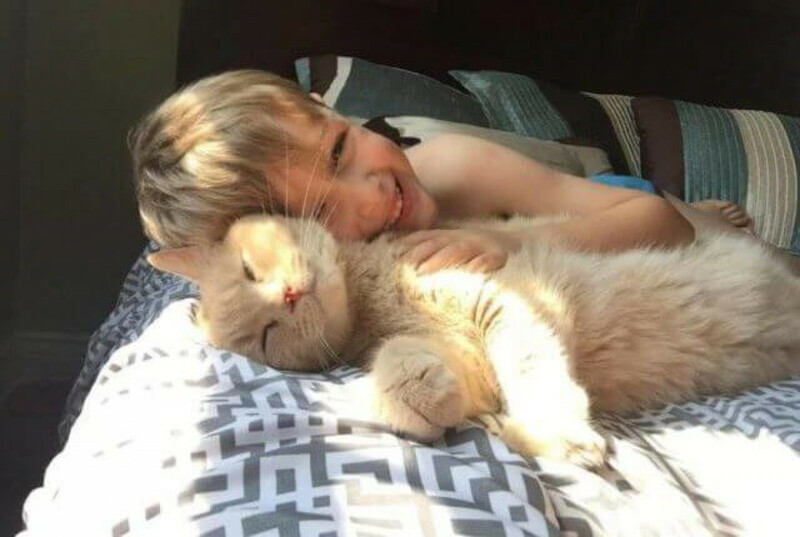 Once there, Easton did what Easton does best: he loved his cat. He stroked the cat's head and softly spoke words of love and encouragement to his new, fuzzy family member. Elizabeth, a proud mother, says the rest was history. The first thing Easton does every time we get home is find both of the cats and say ‘Hi’ and pet their heads. Oscar usually waits on the step for him to get home because he walks him to the bus stop and back. He is pretty much a chubby cat whisperer! 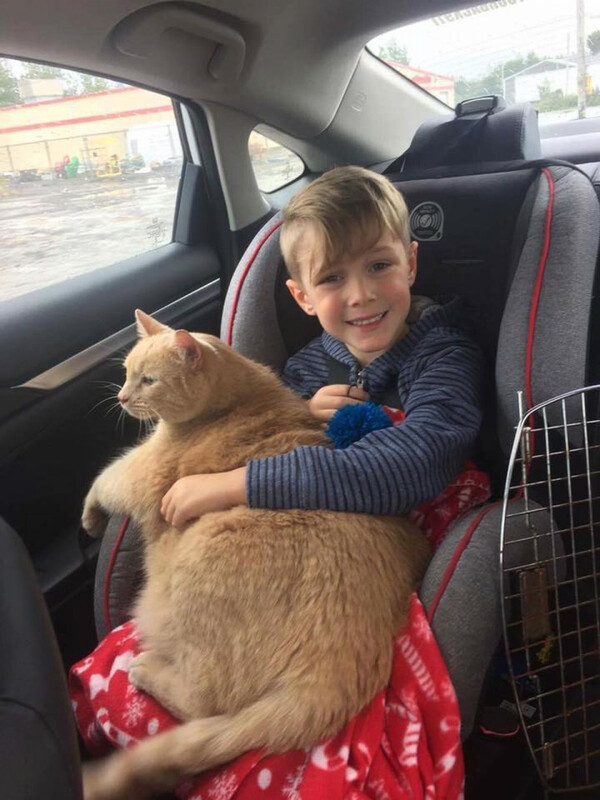 Like many shelters, Exploits Valley SPCA likes to share their success stories of helping cats find homes and Tiny's story was so endearing it went viral quickly. 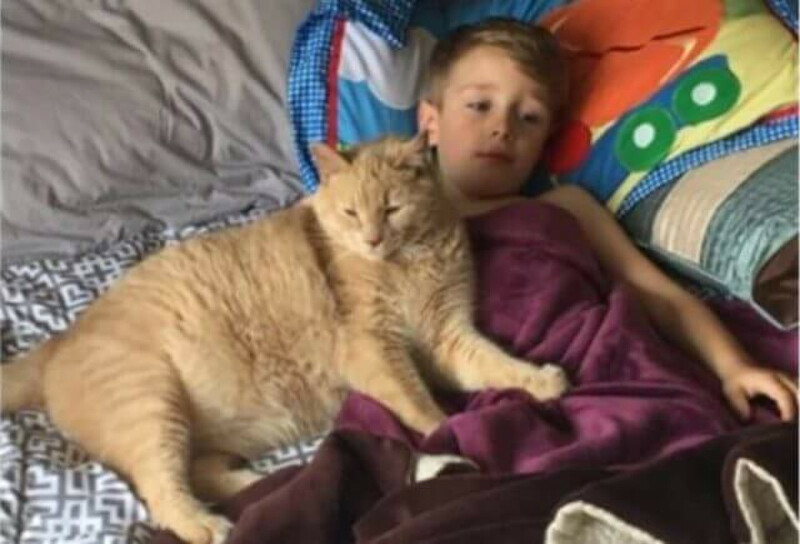 It was the first time the EVSPCA had one of their adoption stories go viral but sure enough 10-years-old Tiny and his new human Easton managed 45,000 reactions to their Facebook post,16,000 shares, and nearly 4,000 comments! Adding to the good news, Tiny's story has helped bring some much needed attention to the joys of adopting senior cats and other special needs cats. And anything that helps bring awareness to this subject matter is definitely worth going viral. Easton has always been a child who takes to personalities and temperaments over size or shape. As soon as Tiny nuzzled into him, that was it!